This nutritionally balanced meal plan is suitable for men and women and contains 1,500 calories a day, at least five portions of fruit and veg and is carb-counted for you. Begin your week with a bowl of Apricot porridge with toasted seeds, have a Chickpea and tuna saladfor lunch and this Mixed vegetable and bean curry for dinner. Kick off your day with Almond, apricot and pumpkin seed granola, have a chicken sandwich for lunch, followed by a Crisp salmon salad and this Blackberry upside down pudding for tea. Plus some Spicy roasted chickpeas as a snack when you fancy. Enjoy this quick Microwave mug full of apple and cinnamon fruity porridge for breakfast, a jacket potato with tuna mayo for lunch, a Wholemeal fruit bar as a snack and a Chicken and lentil curry for tea. If you fancy a snack, try a slice of this Banana bread, too. Breakfast is an Apple and muesli smoothie, followed by a lunch of Tandoori chicken chapatti, a snack of a Wholemeal fruit bar and this Lamb tagine for dinner. 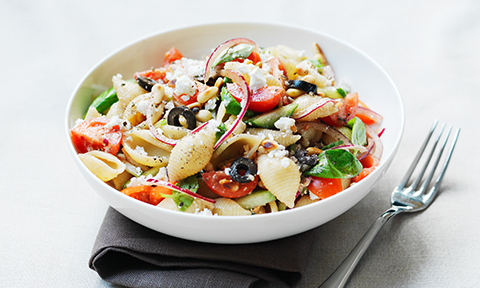 Start the day with bran flakes, followed by this Mediterranean pasta salad for lunch and Cod with tomato sauce for dinner. Try a bowl of Almond, apricot and pumpkin seed granola for your breakfast. Have a slice of Banana bread as a mid-morning snack and a lunch consisting of this Mackerel salsa wrap and, instead of visiting the takeaway, make this easy Chicken chow mein. Have Avocado, banana and cashew toast for breakfast, followed by this Spicy butternut squash soup for lunch and Tortillas stuffed with chicken salad for dinner.